Takeaway: Quinoa is an effective way to swap out refined carbs such as white bread, white rice, and flour from your diet. Its high fiber quotient also helps regulate bowel movements, lower blood pressure, and reduce cholesterol. Quinoa is one of the only plant food that carries all nine essential amino acids. 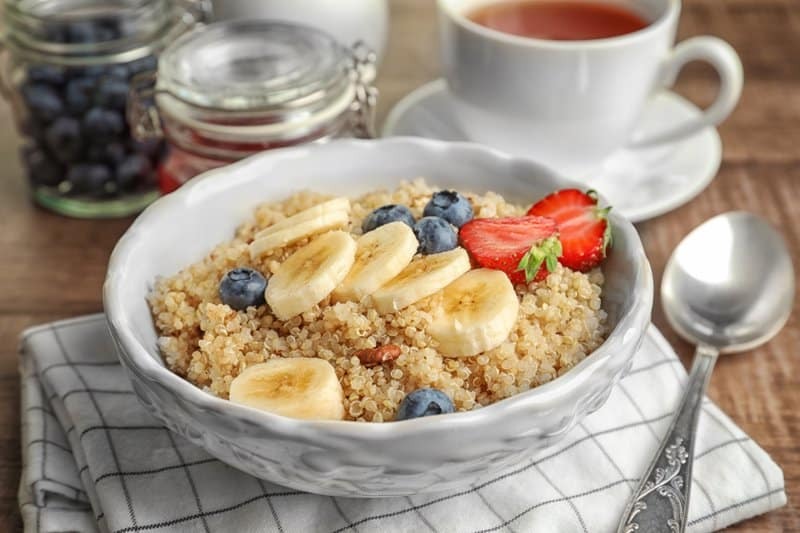 Whether you’re trying to maintain or lose weight, having quinoa for breakfast can provide many healthy and delicious benefits to any diet plan. 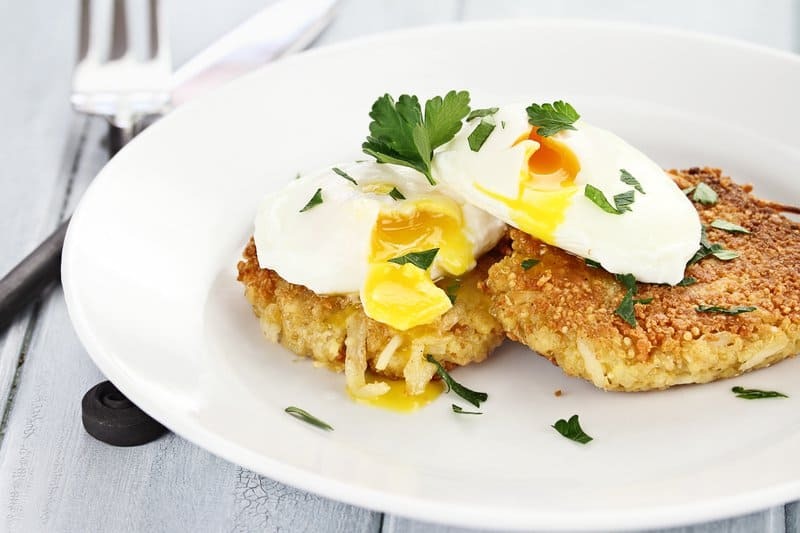 These quinoa breakfast recipes will enhance any healthy morning routine. Unlike other trendy foods, Quinoa (pronounced keen-wah) deserves all the hype it gets. 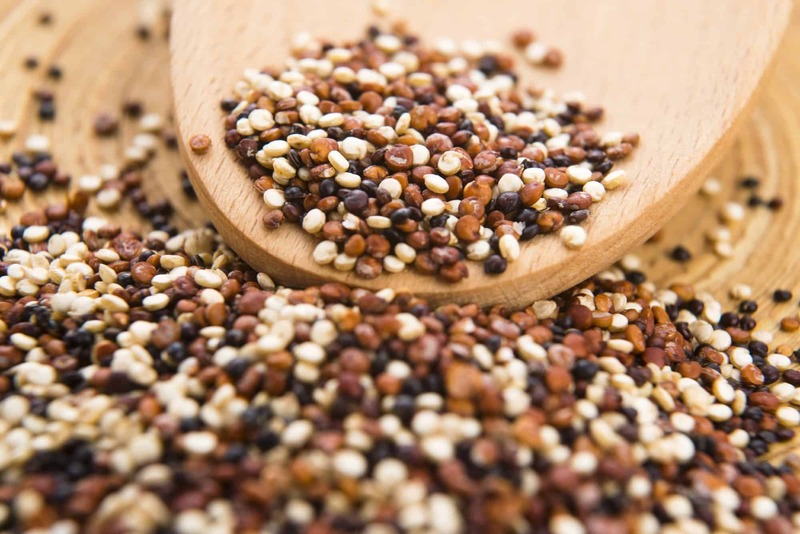 Quinoa was first cultivated over 5,000 years ago and was known to the Incas as the mother of all grains. 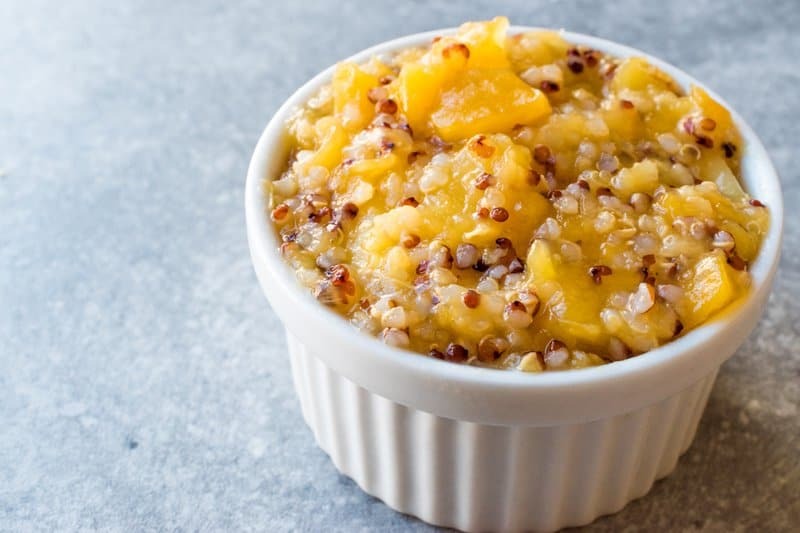 Quinoa is a gluten-free, ancient whole grain that’s high in protein and is one of the only plant foods that carries all nine essential amino acids. Today, you can find this sacred grain at your local supermarket, farmers market, or as a featured menu item at your favorite healthy restaurant. Quinoa mainly comes in three different varieties: white, red and black. It has a natural coating of saponin which helps keep insects away without the use of pesticides. Most quinoa is rinsed before being packaged, but you can easily remove any excess saponin by rinsing it once more with water before consumption. Quinoa is one of the only complete proteins that is derived from a plant. It contains all of the amino acids that our bodies cannot produce on its own; therefore regular consumption of quinoa can be very beneficial to our health. Its high fiber quotient also helps regulate bowel movements, lower blood pressure, and reduce cholesterol. Quinoa can also provide the body with antioxidants that you other grains may be lacking in. It is also packed with iron and manganese which is essential for your metabolism and antioxidant system. Quinoa is an effective way to swap out refined carbs such as white bread, white rice, and flour from your diet. A 2017 research study resulted in a 70% reduction of metabolic syndrome in overweight participants who incorporated quinoa into their diet. The protein content in quinoa can both help you stay full for an extended period of time and increase your metabolism. 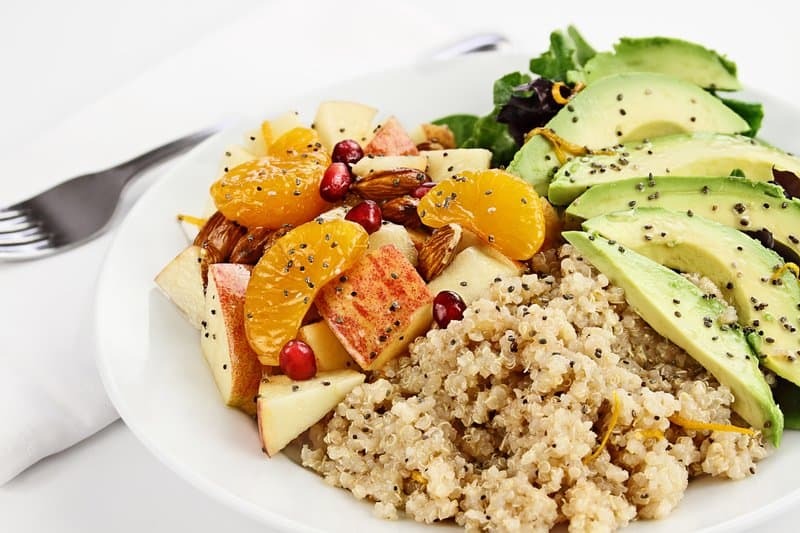 The fiber in quinoa also contributes to making you feel full and prevent further snacking throughout the day which helps you consume fewer calories if you’re watching your weight. A quinoa breakfast could help hold you over till lunch and keep you away from the snack basket at the office. Also contains some calcium, omega-3 fatty acids, and vitamin B3 and E.
Chocolate for breakfast? Sign us up! There is no better way to start the day than with chocolate, protein, and fiber. This nutrient-dense breakfast bowl is naturally sweetened with maple syrup and rich with antioxidants (thanks to the cocoa powder). Top it off with some fresh fruit and a square of dark chocolate for a healthy and balanced meal. This hearty whole-grain breakfast bowl incorporates all the nutrients you need for that Monday morning energy boost. Topped with a soft-boiled egg for added creaminess and nutrition, this bowl will keep you feeling satisfied well past snack time. The added avocado and tomato will provide your taste buds with a savory burst of flavor. 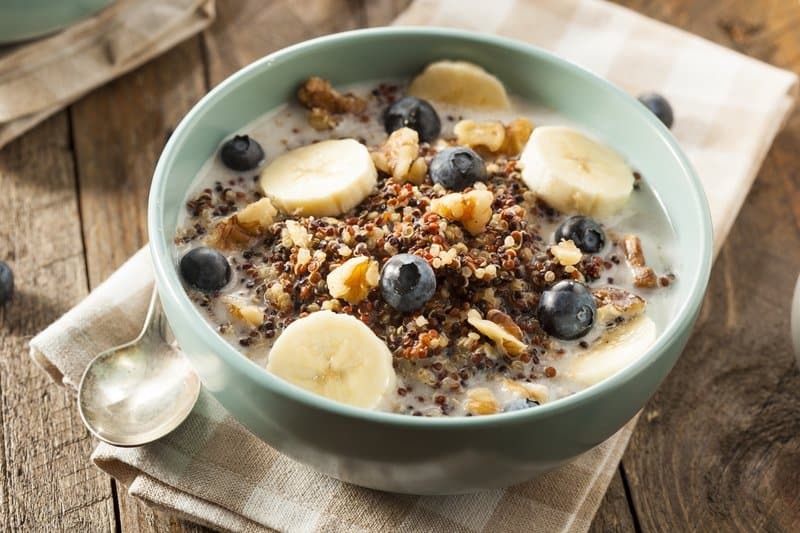 If you love the combinations of peanut butter and bananas, this is the quinoa breakfast bowl recipe for you! This bowl is incredibly creamy and packed with protein. Kick start your morning with plenty of fiber, potassium, and energy! The dried Aleppo pepper makes this hearty breakfast quinoa bowl by adding depth and a lot of spice. It takes minutes to make and yet is impressive, healthy, and satisfying. Top it off with a poached egg for added protein and healthy fats. This breakfast bowl is loaded with protein and fiber, with about half of the total protein coming from the quinoa. This recipe uses red quinoa which is the highest in antioxidants and holds its shape while cooking. Top it off with salsa, avocado, and greek yogurt for a savory and filling breakfast bowl. An easy, make-ahead of time quinoa breakfast that is vegan, refined-sugar-free, and absolutely delicious. With 9 servings, you’ll have breakfast for a whole week, and then some! If you have a sweet tooth, you can add in chocolate chips, coconut, or chopped dried fruit to this recipe for that extra sweet kick. These simple quinoa breakfast bars are packed with protein and whole grains, naturally sweetened, gluten-free, and contain zero oil or butter. This recipe is super flexible allowing you to sub ingredients for those you have on hand (like using peanut butter instead of almond butter). You can even swap the blueberries for strawberries and add chocolate chips. This is the perfect on-the-go healthy breakfast option! These Lemon Raspberry Quinoa Breakfast Bars are a nutritious, high protein breakfast that will jump-start your morning. They are naturally sweetened, vegan, and gluten-free. The tangy lemon twist makes these bar the go-to breakfast on a sunny Summer day! Even better, they’re only 109 calories per serving! 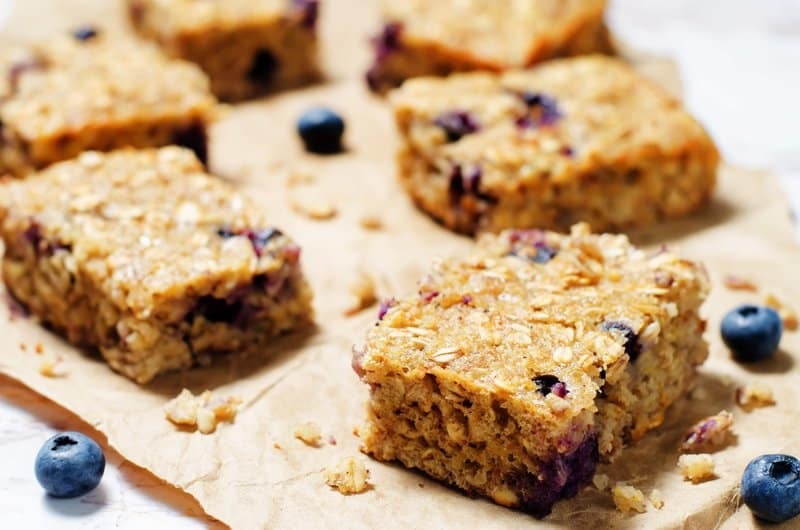 Your kids will love these nutritious breakfast bars! A sweet and chewy easy make-ahead of time breakfast to grab on the go. Packed with plenty of protein and whole grains to keep you satisfied until lunch. These go great with a cup of milk for some added vitamin D.
The pumpkin butter swirl in this overnight quinoa breakfast makes this recipe a must try! This recipe is full of healthy antioxidants and has plenty of fiber. You can follow the recipe as is, or swap some of the fruits and personalize it to your liking. 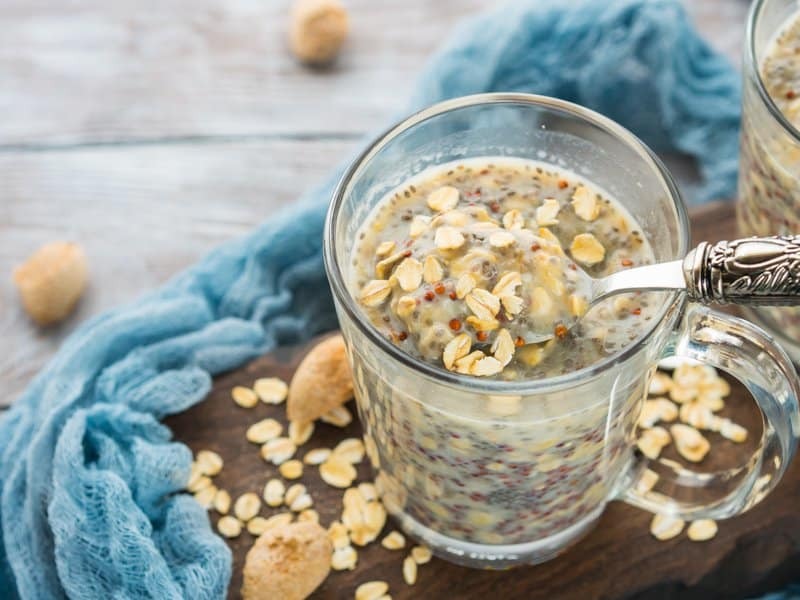 A quick, easy and nutrient-rich breakfast, this overnight quinoa is flavored with almond and vanilla extract and sweetened with maple syrup. Start your morning with the 14 grams of protein in this quinoa breakfast option! This recipe also has 15 grams of fiber (60% recommended daily allowance)! If there ever was a breakfast that checked every nutritional box, this is it. This awesome breakfast bowl is a source of many nutrients and is such an excellent way to start the day. This overnight quinoa breakfast recipe saves you so much time in the morning! Just sprinkle on your favorite recipes in the morning, and you’ll be on your merry way! This breakfast bake is highly customizable. You can use quick or rolled oats, eggs or egg whites, milk of choice and even add a scoop of protein powder. The sweetness of the entire dish depends on the fruit you use and the kind of protein powder. Serve with some plain yogurt for added creaminess and guilt-free indulgence! Whip up a batch of this gluten-free quinoa bake featuring soft, cinnamon-spiced apples, raisins, and crunchy almonds. You’ll have breakfast made for the next six mornings with this quinoa breakfast bake recipe. This 269 calorie breakfast should be prepped Sunday night as you prepare for a new week of productivity. The quinoa in this recipe gets baked in the oven, so it doesn’t need to be precooked. Instead, it settles into the bottom of the pan and creates a moist crust. Get 18 grams of protein per serving with this gluten-free, vegetarian-diet-friendly breakfast option. For this breakfast casserole, quinoa will act like a sweet, not savory, dish. All berries are welcomed in this recipe, so pick your favorite! You and your family will have breakfast for days. This dish is a fluffy, nutritious alternative to pancakes, waffles, and french toast! A perfect combination of coconut milk, vanilla, and cinnamon, this breakfast pudding will make your childhood dreams of having dessert for breakfast come true! This recipe is entirely soy, nut, and gluten-free. Leftover pudding will keep for two nights in an airtight container in the fridge and can easily be reheated. This breakfast recipe could not be more simple; mix four ingredients and stash it in the fridge to chill overnight. The flavor is lightly chocolaty without being overly sweet with a nutty/crunchy texture. This dairy-free and gluten-free pudding is packed with protein, fiber, and energy-boosting nutrition to start the day (and it’s only 150 calories per serving)! This tasty dessert inspired recipe is rich, creamy, and warming with all of the protein and fiber needed to get a jump on the day. It is filling, but won’t leave you with the “brick in your stomach” feeling or a sugar crash a few hours later. 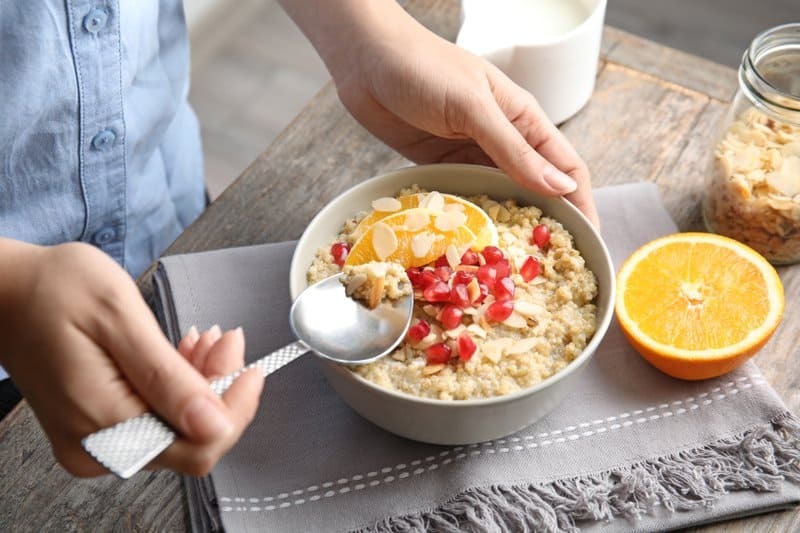 Warm or cold, adding toppings to this breakfast quinoa rice pudding takes it to the next level. This quinoa cereal idea comes from Bolivia, a country in central South America where much of the world’s quinoa is grown. This creamy hot breakfast cereal is infused with an aromatic chai-inspired blend of spices—cinnamon, nutmeg, and ginger. With only 311 calories per serving, this heart healthy, dairy-free breakfast cereal is a must try. This breakfast cereal is so much better for you than store-bought packaged cereal. It’s gluten-free, refined sugar-free, and a complete protein! This quinoa breakfast cereal is also loaded up with the crunch of hemp seeds, almonds and pecans, spiced with delicious cinnamon, and lightly sweetened with pure maple syrup and dried apricots. Kevin Curry, the author of Fit Men Cook, has labeled these breakfast muffins as highly customizable and “just really, really good.” He came up with this delicious recipe while cooking quinoa and realizing he had a lot of leftovers. Curry quickly turned these leftovers into a delicious tray of low-calorie blueberry banana breakfast muffins! Packed with loads of fresh seasonal vegetables, these quinoa breakfast muffins only requires 7 ingredients and simple cooking methods. With a serving size of 6, you can feed your whole family a heart-healthy and nutritious breakfast! 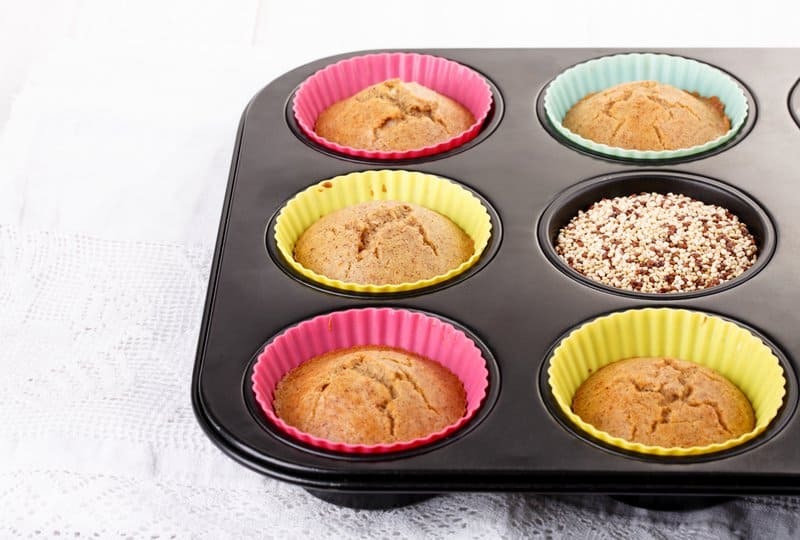 These muffins are also highly customizable; so if you have any picky eaters at home, you can always swap out the ingredients they don’t particularly like. If you plan on attending a brunch and need a dish to bring, then this is the quinoa breakfast muffin recipe for you. Packed with protein, cinnamon, and natural sweetness, these ultra moist Carrot Quinoa Muffins will be an instant hit among all party-goers! Did we mention they pair well with mimosas? You even have the option of customizing the level of sweetness in these muffins to your liking. This 6 ingredient quinoa breakfast muffin recipe is simple and delicious! They’re packed with 7 grams of protein and are only 87 calories per serving. These are great breakfast muffins to incorporate into any meal prep diet plan. The grated apples in this savory quinoa muffin recipe add plenty of flavor and moisture. The sharp cheddar cheese in this recipe also pairs well with a variety of soups and stews. This quinoa breakfast muffin recipe takes whole-wheat flour, but for a gluten-free alternative, you can use gluten-free flour instead. This recipe is packed with a variety of veggies and flavor! Among the vegetables are carrots, sweet peas, and bell peppers. It yields 4-5 full servings so that you can feed your entire family a hearty, wholesome dish for breakfast. This quinoa breakfast casserole is an excellent way to kick start your day. It’s packed with a variety of fresh veggies, feta cheese, and quinoa for a mouth full of flavor and nutrients. This recipe is both gluten-free and suitable for vegetarians. 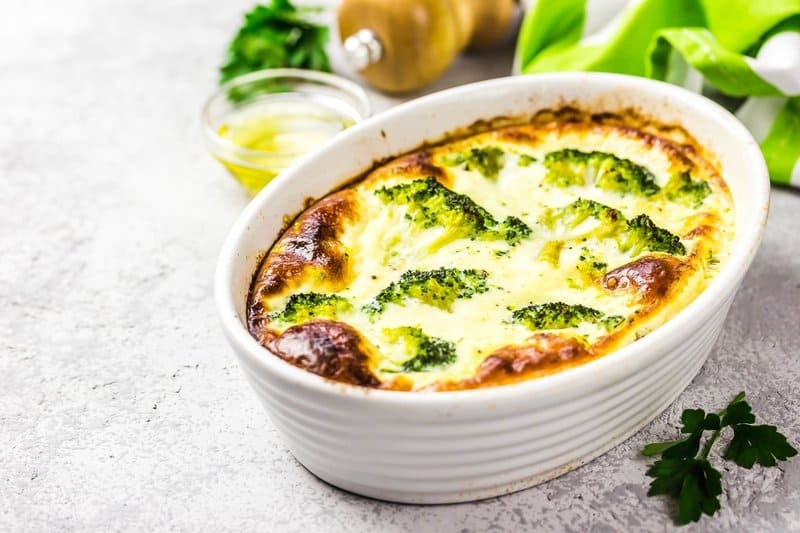 Make one pan of this veggie-packed egg and quinoa casserole, and you’re set for a week’s worth of breakfasts! It makes five servings of hearty, protein-packed meals. Just reheat briefly in a microwave or toaster oven, and go. You can swap the spinach and tomatoes for any other vegetables you like. This ham and swiss quinoa egg bake is hearty and completely satisfying. There are 10 generous servings, and each one is only 207 calories. Think of this recipe as the ultimate breakfast sandwich! You can even opt for eating this dish for lunch instead. Who says slow cookers can only be used for dinners? You can make delicious and nutritious overnight quinoa oats in this wonderful machine! 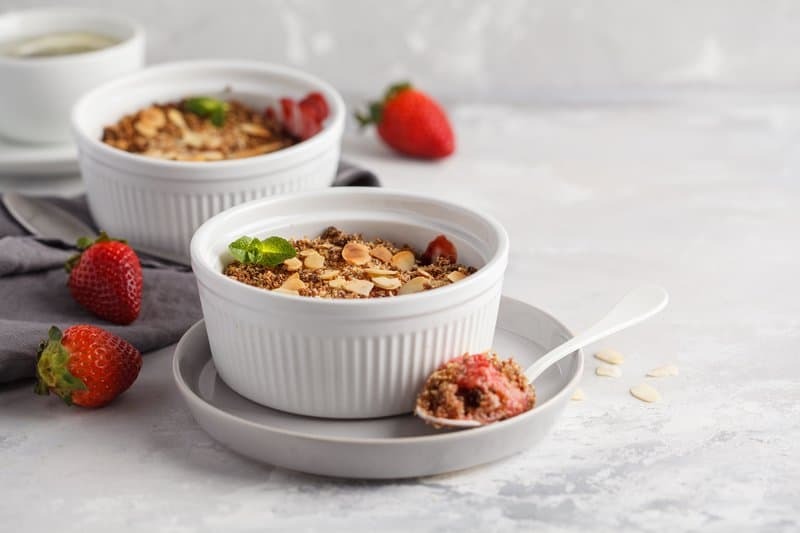 Throw in some strawberries, banana, milk, and almond butter for a warm and tasty morning dish with this slow cooker quinoa breakfast recipe. The great thing about using coconut milk as your breakfast base is that you don’t actually have to cook any of the ingredients that you mix with it! You can use quinoa as a substitute for cereal, and make one crunchy and delicious bowl of breakfast magic. 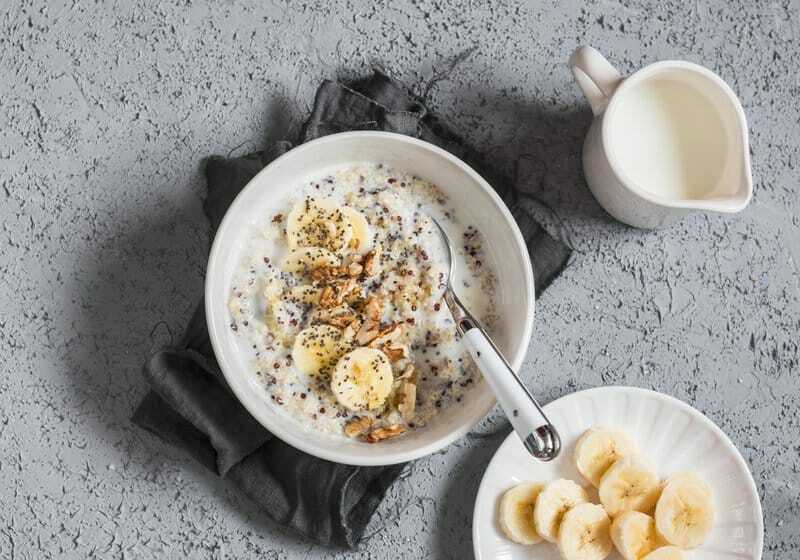 Give this coconut milk quinoa breakfast recipe a try! Steel cut oatmeal and quinoa are combined in this hearty breakfast recipe. 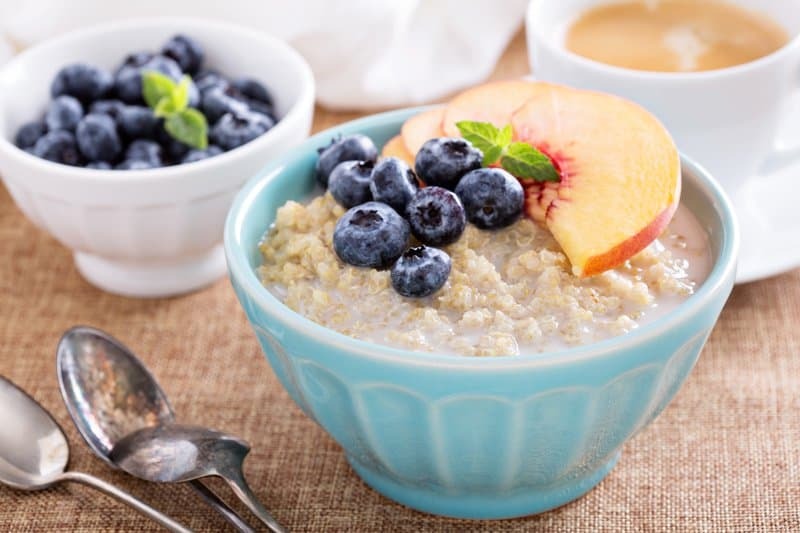 Filled with fiber and protein, this Quinoa Oatmeal is sure to keep you full until lunch! Top with berries, maple syrup, chia seeds, or whatever you typically like to top your oatmeal. The tart, crispiness, and sweetness of apples make them compatible with almost any breakfast dish. 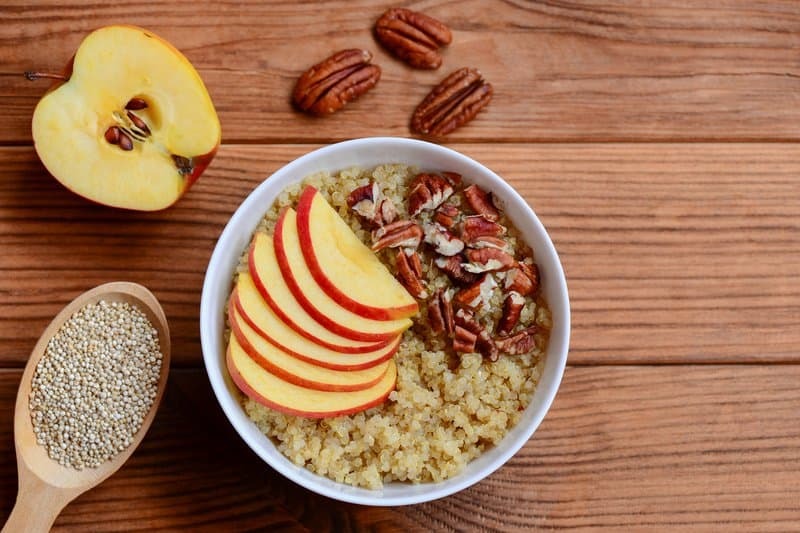 This Apple Pie Quinoa Breakfast Bowl perfect for that crisp fall morning! The perfect breakfast to prep and store in mason jars to use throughout the week. And a great way to use up some leftover quinoa and showcase seasonal fruit (yes, you can swap out the blueberries for any fruit of your choice)! These little jars of goodness last 3-4 days in the fridge. This Cranberry & Apple Quinoa Breakfast Bowl is a delicious sweet morning treat to help you fuel the day ahead. The cranberries in this recipe add an antioxidant to your diet, providing additional health benefits to your breakfast!